The time is here for special holiday movies and sports viewing which makes this the perfect time to consider a new home theater. 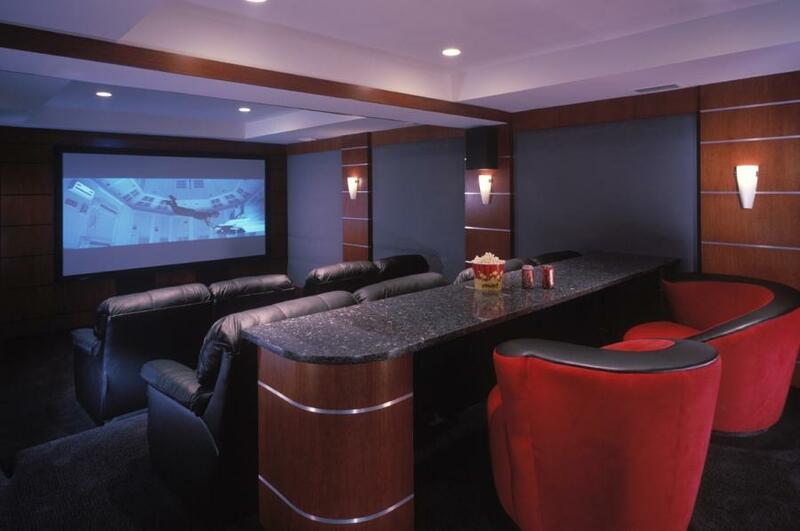 Home theaters are a place where you relax, entertain your guests, and bring your family together. 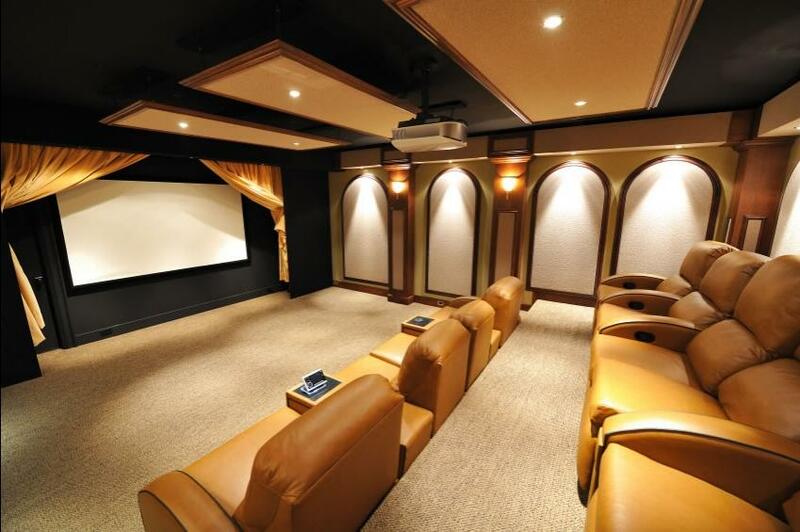 Each family has different needs when it comes to a home theater experience. Some need a lighting system, remote control curtains, and rows of recliners while others simply need a comfortable room designed for movie watching. 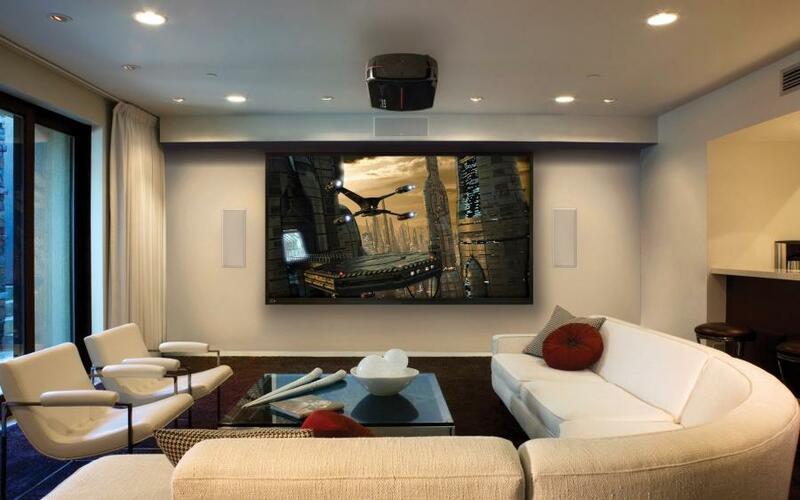 For fantastic ideas for home theater features you and your family might want, take a look at these three examples. There are warm amber tones throughout this room designed against black and white. You see the amber in the comfortable golden leather recliners and in the light panels that hang from the ceiling. The amber ambiance continues with the gold drapes pulled back from the screen and the wall lights with their amber glow effect. An element of style is added with the minimal lighting design. When the lights are on, the room is awakened with subtle highlights. With recessed lights placements over the arch panels, it gives the illusion of shadowy drapes to enhance the theater theme. The black wall and ceiling are perfect for a theater room because they seem to disappear when the lights are dimmed and the movie begins. If you’re looking for a top-notch, modern home theater that exudes with comfort and warmth, use this as an example for your design. If you prefer a modern deco design the whole family will love, consider this home theater with its subtle yet highly stylized multi-textures throughout the room. Lighting in this room is simple with overhead canister lighting and soft wall lights that adorn the wood panels with chrome strips that are all reminiscent of the golden age of movies or also referenced as the art deco era. Kindly notice that there are no sharp corners in this home theater for a safe and bruise-free experience for children and adults. However, the extraordinary feature in this home theater is the buffet or snack table with its stone top over a beautifully curved wooden end. We think this table is a brilliant and useful addition to this home theater design. Add to that, the red, round, swivel chairs that hold true to the design era of this room. These red swivel chairs will delight every child or child-at-heart who walks into this room. We love this urban, contemporary style in this home theater with white sofa, chairs, walls, and ceiling. 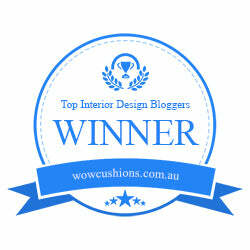 The dark brown of the carpet, the black and white herringbone pattern, and deep red pillows warm the entire room. The white carries over into the full-length insulated drapes along with the recessed, adjustable lighting. With this combination, you’ve got options for the best entertainment experience possible. Notice how the speakers nicely recess into the walls and all electrical cords are out of sight. This room looks ready for action movies and popcorn! Whatever design you choose, we hope you find inspiration with these examples. We send a warm wish to you that your holidays are full of love, family, and fantastic entertainment.